I wish I would have taken a picture. Not of the crowds; I took plenty of those. Of the sign – The sign was everything. Yesterday, I was privileged to take part in the Women’s March in Charlotte, NC. Thousands and thousands of people – more than 10,000 by the latest police department estimate – walked through the streets of uptown Charlotte because a statement needed to be made. The recent election and inauguration of a new American president with a long and demonstrable record of minimizing sexual assault, taking advantage of the vulnerable, and protecting his own interests at all costs triggered this outpouring of emotion. There is real fear, anxiety, and trauma around what all of this might mean. It is not fabricated. Do not let anyone tell you otherwise. 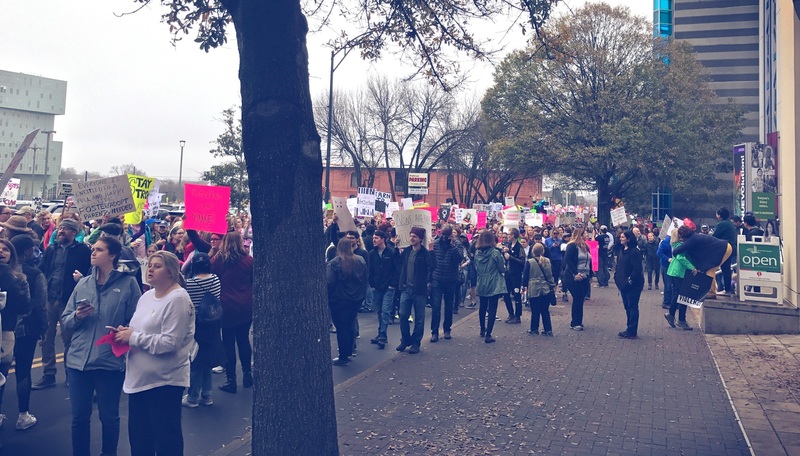 But, as one sign (not the sign) read, “You’re so vain, you probably think this march is about you.” Though there were some who chanted and carried signs calling out the new president, the vast majority of people wanted only to demonstrate. These were not protesters. These were demonstrators. They were standing – marching – among others who wished to send a message of solidarity. We were a force – a force who would not cower in fear or anxiety. We were a force who were willing to stand and be counted as decent, loving, compassionate human beings intending to make an impact on the world around us. Regardless of how any one elected official can impact the reputation of a nation, we will stand for the virtues that we hold dear. Equal rights. Togetherness. A responsibility to one another. I proudly marched and I realize that it will probably not be long before I will need to march again. I will. There was so much to take in. Every one of those 10,000 people represented a story. Some, like me, were men who are tired of double standards and locker room talk. We recognize the the value of our female friends and family members isn’t based on which males they may be associated with. My wife represents another story. She’s a straight, white female – privileged in many ways. But she has felt reduced and objectified, like so many other women, because of the ridiculous notion that a boy’s right to be a boy comes at the expense of a woman’s sense of self-worth. There were people who carried signs that implored others to try to see the world from the perspective of any one of those marchers. One young woman carried a sign that read “In 2017, I expected to driving a hovercraft, not fighting for my rights.” Some had daughters who were assaulted or worse. Some had been disowned because of they were attracted to the wrong person. It is one thing to be unaware of the circumstance of another human being. Only with awareness can we take steps to understand. But to actively minimize another’s experience is perhaps the ultimate in arrogance. To dismiss stories of millions of individuals around the world, from every walk of life requires a level of ignorance that is absolutely unfathomable. Faced with a differing values and perspectives, you have just a couple of choices for action. You can use your energy to explain the difference away, selecting information that only confirms your entrenched view. You can ignore and active keep that perspective from entering your mind, protecting what you already believe. Or, you can active engage with the difference, pursuing information so that, even if you don’t agree, you can at least admit that the other’s perspective makes sense. When we pursue the third option, we are fostering opportunity for people to come together. You cannot argue with something you do not understand. You cannot convince someone with words. It is only by action and experience that our minds can engage the richness of understanding the other’s world. Is it time to unite Americans? Then empathy is what is truly needed. We need to understand each other and that is never accomplished through words alone. It’s accomplished by coexisting and by approaching rather than turning away. It’s accomplished by working in ways counter to the ways that have proven themselves not to work in the past. When we entrench in our idealistic stances and see compromise as a dirty word we are continuing to divide ourselves. Every. Single. Day. So let me tell you about the sign. It was carried by a little boy, small enough to be pushed by his dad in a stroller through the streets of Charlotte, but large enough to help his parents create the sign that he would carry on the demonstration. The sign itself was created on simple white poster board. A child – I’m assuming the little boy – had scribbled something that I’m sure was meaningful to him but whose meaning was obscured from most of the adults who were unable to read through his eyes. Then, multi-colored foam letters, and pasted with imperfect placement were these words: My sister is smart. I do wish I would have taken a picture, but at the same time, I’m glad that I was able to be present in that moment with that experience. I thought about everything that had to happen in order for that sign to be sitting in that child’s lap directly in front of me. A parent had to, first of all, care that the women’s marches were evening happening and to agree that this cause was something worth showing up for. That parent had to sit down with that child and invite them into the process of making a sign. They probably asked the boy about what he thought about his sister and told him that what he said they would put on his sign. I also thought about all the things he didn’t say. He didn’t say that she was pretty. He didn’t say that she was too emotional. He didn’t say that she was a member of the second best gender or that she should learn how to keep a house. He didn’t say that he cannot wait until she gets older so that people could objectify her and take advantage of their power over her. He said she was smart. His parents agreed. They didn’t try to steer him to something else. They validated him and the choice that he made. They didn’t try to tell him that’s not what they were looking for. They helped him add paste to the back of the letters and they probably pointed to the approximate place the letters should go. I was so grateful in that moment. Here is a child who has a great foundation. He has parents who love him and invite him into think about his sisters – all of his sisters – in helpful, respectful ways. Hopefully, they can help him navigate the many confusing and contradictory messages that he will start to be exposed to about the roles that his sisters should fall into or about their value in the world. Hopefully, he can continue to see her through child-like eyes that can see her for who she truly is. Hopefully, we can all learn a little something from him. Great read, as always. You were able to glean so much from that simple sign. Thank you for bringing this to me. My second most favourite part was the fifth paragraph, about minimizing others’ experiences and how to deal with differing perspectives. Thanks Heather! Glad it was helpful! !